The Shores of Surfside I. Come to Surfside Beach. 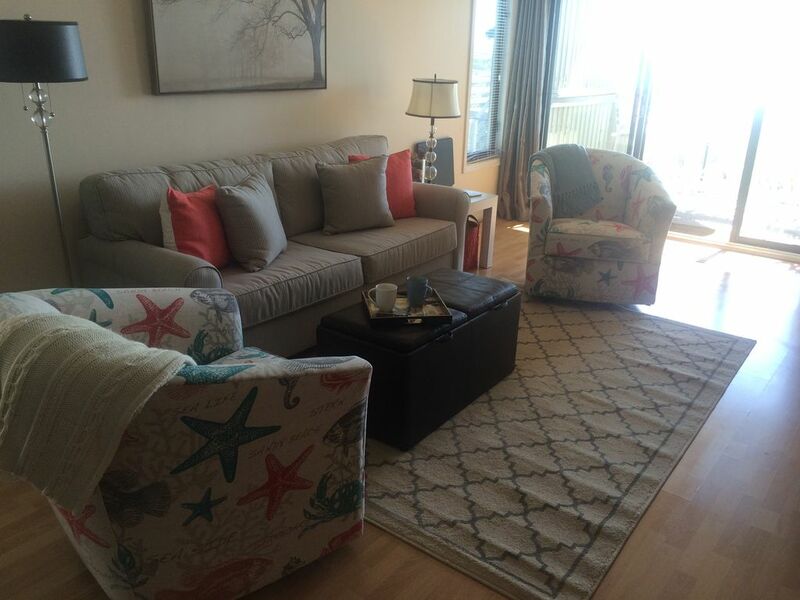 'The Family Beach' - relax in the sun and enjoy our newly redecorated condo. You can't get any closer to the ocean than our very light and spacious OCEANFRONT 1st floor END unit. Come and vacation in our SPACIOUS (1150 Sq. ft.), fully-equipped, two bedroom, two bath condominium. Our condo is centrally located on the Grand Strand and we are only minutes from great restaurants, golf, shopping and entertainment for the whole family. Your close enough to enjoy all the attractions of Myrtle Beach without all the congestion and crowds. We are only minutes from Murells Inlet which has been voted to have the best seafood restaurants in the area. We are also only minutes from Broadway on the Beach and the airport. Known as the 'Family Beach,' Surfside limits hi-rises reducing the crowds and traffic. Our condo is an end unit on the first floor of a 14 unit complex and has quick and easy access to the beach and a full sized oceanfront swimming pool. Next to the pool is a barbeque area for those nights when you just want to stay in. Along the back side of the pool is the private access to the beach. Our home away from home is fully furnished with all the comforts. There is a king-size bed in the master bedroom, two twin-size beds in the second bedroom, and a pull-out queen-size sofa bed in the living room. All bedrooms are equipped with pillows, comforters and blankets. Linens are available on request. Our condo is a non-smoking unit. We are restricted to 2 parking spaces and due to limited space no trailers, boats or campers are allowed. We do ask that all our renters please treat our unit as they would their own. 5/2017 - New sheet rock in Master bedroom and Bathroom New porcelain tile and carpeting. New lights fixtures and freshly painted in a Sherman Williams Dove Gray paint. 11/2015 New Living Room Furniture, new bedding in Master and 2nd bedrooms, new washer and dryer. So come and relax on our private balcony and enjoy a cup coffee while watching the sun rise over the ocean. My husband and I are orginally from Rochester, NY. We moved to Greenville, SC in 2006 and now are able to spend alot more time at our condo when it is not rented. We just LOVE the ocean!! We have been vacationing in the Myrtle Beach area for 30 years and just fell in love with the Surfside Beach area due to the quiet beaches and family atmosphere. "Free Use" Linens available for use. We only ask that you wash, fold and place them back into the storage containers.